Gerald Llanes and his son Keola were competing in the 2014 S. Tokunaga Store Ulua Challenge when Gerald took a massive strike on his 12'7" IRW pole. He battled the fish using 80-lb test line spooled on a Penn Squall 60 LD reel. When they hung the monster on the scales at the Hilo Civic Auditorium, the crowd went wild. The neon digital scale glowed with 103.8 lbs; enough for second place, Ulua Category, in the most prestigious shorecasting tournament in Hawaii. 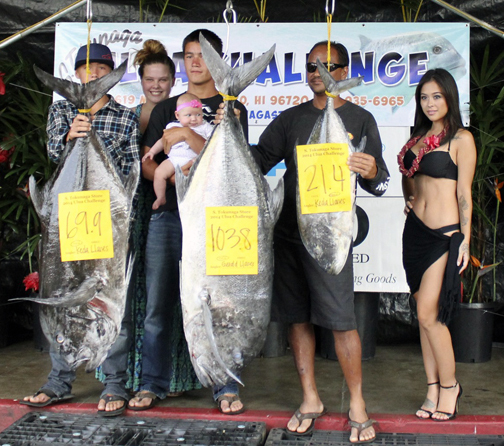 Gerald's son, Keola, landed a 21.4-lb omilu during the tournament to win first place in the Omilu Category. What a team!